At SHOT Show last year we visited the Sellier & Bellot pavilion. You may not have heard of this company, but it is one of Europe’s older ammunition manufacturers. 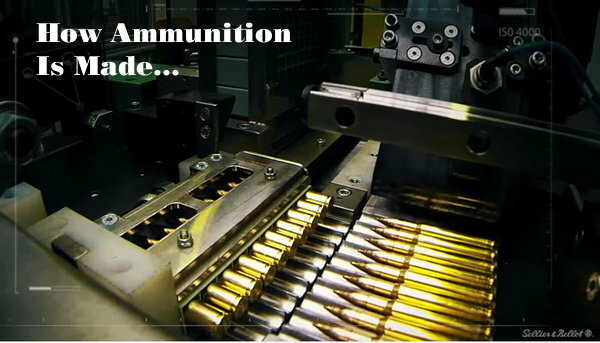 The video below shows ammunition being made from start to finish, starting with raw materials. This is a fascinating video that is well worth watching. It shows some amazing machines in operation. EDITOR: Guys, this really is an exceptional video that shows every aspect of production. I have watched dozens of videos about ammo making. This is definitely one of the BEST. Take the time to watch. Based in in Vlašim, Czech Republic, Sellier & Bellot was founded in August 5, 1825 by a German businessman of French origins called Louis Sellier. His family were royalists who fled France during the French Revolution. Louis Sellier began manufacturing percussion caps for infantry firearms in a factory in Prague, Bohemia on the request of Francis I, the Emperor of Austria. Sellier was joined by his countryman Jean Maria Nicolaus Bellot. At the S&B booth, we also saw an interesting CGI video that shows what happens inside a rifle chamber and barrel when a cartridge fires can’t be seen by the naked eye (unless you are a Super-Hero with X-Ray vision). But now, with the help of 3D-style computer animation, you can see every stage in the process of a rifle round being fired. In this X-Ray-style 3D animation illustrates the primer igniting, the propellant burning, and the bullet moving through the barrel. The video then shows how the bullet spins as it flies along its trajectory. Finally, this animation shows the bullet impacting ballistic gelatin. Watch the bullet mushroom and deform as it creates a “wound channel” in the gelatin. Share the post "Watch Ammo Being Made in Revealing Video"
Share the post "Watch Ammo Being Made in Sellier & Bellot Video"
You may have already heard this news, but we wanted to repeat it for our readers. Czech ammo-maker Sellier & Bellot was acquired in April by Companhia Brasileira de Cartuchos (CBC) a Brazilian enterprise. CBC produces civilian and military ammunition in calibers up to 30mm, and CBC sells a small line of sporting arms. CBC also owns U.S.-based MagTech Ammunition and Metallwerk Elisenhutte GmbH (MEN) of Germany. Founded in 1825, Sellier & Bellot has been a world leader in ammo production for over 180 years. It produces a very wide range of cartridge types, including pistol ammo, hunting ammo, and a large selection of both modern and “classic” military cartridges. CBC states that Sellier & Bellot will continue under current management, delivering Sellier & Bellot branded ammo through its current sales channels. Share the post "Brazilian Ammo-Maker Acquires Sellier & Bellot"